The Church is Always in Need of Being Reformed. at Sacred Heart Church, Salisbury. In the Temple at Jerusalem, a veil of cloth separated the Holy of Holies from the rest of the sacred precincts; this was a token of the distance between the holiness of God and the sinfulness of man. This is the veil that was torn in two at the death of the Lord Jesus (Luke 23:45), signaling that the types and figures of the Old Covenant had given way to the reality of the New Covenant. But even in these last days, sinful man is still separated from the holiness of the living God, and to glimpse his glory, the veil must be drawn back. The task of a priest, Father Kimbrough used to say, is to draw back the veil between God and man and then hide himself in the folds. And so he did, first as an ordained minister of the Episcopal Church and then as a priest of Jesus Christ in the Catholic Church; for decade after decade, Father Kimbrough drew back the veil for us and then hid himself in the folds. Conrad Lewis Kimbrough was born right here is Salisbury on 10 May 1927 -- or, as he loved to point out, on Confederate Memorial Day, and he wasn’t just born here, he was born again here by water and the Holy Spirit at the First United Methodist Church of Salisbury when he was eleven years old. He began to attend Methodist Sunday School when he was just three, and from his teachers, his mother, and above all from the Sacred Scriptures, he learned the truth of the Gospel and never departed from the life changing conviction that Jesus Christ is Lord. During the first year of his undergraduate studies, Conrad made a decision that changed his life. On 8 April 1945, one month before his 18th birthday and the end of the Second World War in Europe, he was confirmed in the Episcopal Church, and in so doing, Conrad was convinced that he was fulfilling the counsel of his Methodist classmate to become a Catholic -- albeit, as he would have put it then, in the English, rather than the Italian, branch of the Church. This conviction would sustain his faith, his life, and his work in the Episcopal Church for over thirty years, almost all of which was in Wisconsin, near the seminary he loved, Nashotah House, in what was then called the Biretta Belt of the Episcopal Church -- a swath of Anglican dioceses and parishes that were, both in creed and ritual form, self-consciously catholic. During those three decades in Wisconsin, Father Kimbrough mastered the art of drawing back the veil between God and man through the celebration of the sacred liturgy, the preaching of the Gospel, and the guidance of the lost. Father Kimbrough was heir to the renovation of Anglicanism initiated by the 19th century Oxford Movement, led by the brilliant English scholar and Anglican priest Blessed John Henry Newman, but like Newman, who later left the Church of England and became a Catholic priest, Conrad Kimbrough was increasingly beset by doubts about the reality of the ancient Church, of Catholic faith and order, in a Christian community formed by schism during the 16th century Protestant Reformation. The resolution of these doubts took many years for Father Kimbrough to work out, and while he was still living in Wisconsin, he was invited by friends in Stevens Point to a large gathering of Catholics who were joining a cardinal visiting from Europe for a Mass in a gym. Father Kimbrough’s Catholic friends introduced him to the foreign cardinal, with whom he had a conversation about Anglicanism and his doubts, and Father Kimbrough was delighted that this Catholic bishop from a far country knew so much about Anglicanism and was so sympathetic to his situation. Although he could not receive Holy Communion at the cardinal’s Mass, Father Kimbrough stayed until the end, and to avoid being in anyone’s way, he sat high up on the last bleacher of the gymnasium. As the procession passed by far beneath on the gym floor, the visiting cardinal stopped and gestured for Father Kimbrough to come down. He was deeply moved and ever after said that he felt like sinful Zacchaeus being called down from the sycamore tree. He knelt down to receive the cardinal’s blessing, and that very night Conrad Kimbrough decided to be received into the Catholic Church. Less than one year later, the entire world was introduced to that same cardinal from a far country as Pope John Paul II. Having become a Catholic in Wisconsin, Conrad Kimbrough returned to the land of his birth in the hope of being able to serve the Catholic Church as a priest in North Carolina. 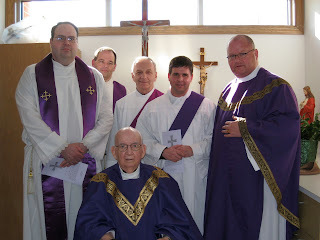 Bishop Michael Begley of Charlotte received Father Kimbrough with great generosity and respect for his twenty-five years of service as an Anglican minister, and on 11 February 1978, the Feast of Our Lady of Lourdes, Conrad Kimbrough was ordained to the priesthood of Jesus Christ. He was 50 years old and just beginning the work of his life in the Catholic Church. Over the next twenty-five years, Father Kimbrough served as pastor of five parishes in the Diocese of Charlotte, and in not one of those assignments was he ever accused of being a superlative administrator. Papers were scattered throughout his rectory on every horizontal surface, mail was left unopened for days, even weeks -- especially mail from the chancery, and when the mail finally was opened, it was then dropped wherever Father Kimbrough happened to be standing or sitting, usually never to be thought of again. But despite the administrative chaos, there was something going on in and through this priest that changed lives. First as a Methodist, then as an Episcopalian, and finally as a Catholic, Conrad Kimbrough knew more surely than he knew his own existence that God exists; he knew that the one, only, living and true God has revealed himself to man through the Covenants with Adam, Noah, Abraham, Moses, and David; he knew that God has revealed himself through the Law and the Prophets of Israel; and he knew that God has revealed himself -- unveiled himself -- finally and fully through the life, death, and Resurrection of Jesus Christ. With a combination of childlike trust in the truth of the Gospel and the simplicity of faith that is found only on the far side of decades of complexity and struggle, Father Kimbrough served as a powerful instrument of grace for those struggling to live the Catholic Faith, for those lost in doubt and sin, and for those searching for something or Someone they knew only that they did not yet know. This was true throughout his ministry as a Catholic priest, but it was perhaps nowhere more pellucidly clear than during his service as pastor of St. Benedict’s, Greensboro. It was there that I first met him in 1985. I was a callow seminarian, and he was a crusty, cantankerous curmudgeon who had no patience for ecclesiastical fools. We were an instant pair: the Old Coot and the Young Coot. As I listened to him preach week after week, I heard the Fathers of the Church speaking down the ages. 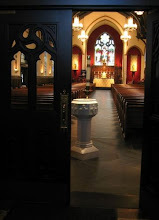 As I watched him spend hours in the confessional and in gentle conversation with the lost and broken souls who came to his door, I understood the Lord’s insistence that what we do for the least of his brethren, we do for him. As I served his Mass day after day, I saw the veil drawn back and watched the priest hide himself in the folds so that we could behold the glory of the Word made flesh, now made present on the Church’s altar. And I was not alone in seeing these things. The flowering of vocations to the priesthood and religious life which came forth from that small congregation is an enduring and remarkable sign of grace. Another powerful sign of grace were the many marriages formed and strengthened by this celibate priest’s faithful witness to God’s eternal plan for married love. Besides seeking to strengthen marriages and to encourage vocations to the priesthood and religious life, Father Kimbrough’s twin passions were proclaiming the Gospel of Life and bringing souls into the Catholic Church. When he was arrested for praying in front of an abortion chamber, he started making converts behind bars. On one occasion he asked me to accompany him to the county jail with a Mass kit and the holy oils. In a glass room about five feet square, he baptized and confirmed a trembling young man who was accused of and later convicted for murder, and then Father Kimbrough celebrated Mass on a tiny table so that this new Christian -- now repentant and radiant in the certainty of God’s mercy -- could receive for the first and perhaps last time the flesh and blood of the Savior. In that dreadful place we chanted the Missa de Angelis while guards and inmates alike looked on in wonder. Everyone who knew Father Kimbrough has a story like that: absolutely uncompromising faith expressed in always surprising tenderness. It was an irresistible combination, and the lives of countless souls were shaped for the better by the witness of a priest who sought always to hide himself in the folds of the veil drawn back and who spoke most often not of his ordination, but of his baptism, the sacrament in which he was made -- as he loved to say -- a member of Christ, a child of God, and an heir of the Kingdom of Heaven. Beyond his passion for the Church, the Gospel, the sacraments, and the life of grace, Conrad loved the place of his birth and loved everyone to whom he was related, which, if you give credence to his tales, was pretty much everyone he ever met. “Sure is good to be back here in Rowan County,” he would say every time he came home, and he meant it. He intended to lie here in this earth until the Last Day, when he would be restored to his parents and siblings and nieces and nephews and first cousins, and second cousins, and third cousins, and all his cousins from the first generation of Man to the last. Betsy, Frank, and Norman, your brother loved you and your families because you are his flesh and blood, but he also loved you and all of us because he lived and loved in Christ Jesus. In these last years, his health faltered and his body failed, but his faith never wavered. Let St. Paul speak for Conrad Kimbrough: “I consider that the sufferings of this present time are not worth comparing with the glory that is to be revealed to us. For the creation waits with eager longing for the revealing of the sons of God.” (Romans 8: 18-19) Another word for revealing is unveiling. Now he lives no more to die. When we finished the hymn, I said to him, “Father, soon you will be at the wedding feast of the Lamb. The veil will be drawn back for the final time. There will be no signs, and no more sacraments. Just the reality of the Lamb once slain who dies no more.” He asked me to repeat those words to you today. St. Paul’s vision of our present suffering surpassed by future glory through our adoption by grace and the redemption of our bodies in Jesus Christ is why Conrad Kimbrough lived his entire life in joyful expectation of this day. And now that we are here to commit his body to the ground, earth to earth, ashes to ashes, dust to dust, Father Kimbrough would be the first to remind us that we are here to pray for God’s mercy on his soul, to pray for the forgiveness of his sins, and to pray for the hastening of that bright vision in which Conrad Lewis Kimbrough will no longer need signs or sacraments because the veil has been drawn back once and forever so that this faithful priest, who will no longer need to hide in the folds, can see his Lord even as he is seen and be changed from glory into glory. Thanks be to God for the life of his servant Conrad Lewis Kimbrough. May Christ Jesus the merciful Savior acknowledge him now as a sheep of his own fold, a lamb of his own flock, a sinner of his own redeeming, a preacher of his own Gospel, and a steward of his own Mysteries. Grant rest, we pray O Lord, to your priest Conrad with all your saints in light, where sorrow and pain are no more, but perfect peace and everlasting life. Amen. A priest of the Diocese of Charleston and the pastor of St. Mary's Catholic Church in Greenville, South Carolina.